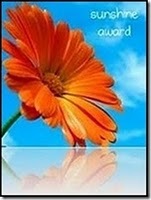 This week I was given a Sunshine Award by Virginia of Celtic House. Virginia started the 'Rocking My World Friday' phenomenon on her fun and funky blog. I was very quick to jump on her bandwagon and play along. Thank you Virginia for giving me this lovely award and, for making me think about the many reasons I have to be cheerful! Ah bless you Penny - loving to see the acceptance speech and now being passed on to amazing people who also have awesome blogs - I will check the out! Hope you are having a fabulous day! Awww thanks Penny, you've made my day by giving me some sunshine! Thanks for the lovely comments...and you know that I think your artwork is awesome too! I just love to come over and read your blog as well as see your art.